Google introduced Android Go, a version of Android Oreo optimized for low-end devices, at its 2017 Google I/O developer conference in May. Mum’s been the word since then, but on Tuesday, the search giant took the wraps off the finalized version of Android Go as part of Android 8.1 Oreo’s rollout. To that end, Android Go has been designed from the ground up for entry-level hardware. It’s tailored for devices having between 512MB and 1GB of RAM, and it takes up 50 percent less storage space than a standard Android Oreo installation. Furthermore, thanks to Android Runtime (ART) compiler and kernel enhancements, Google says the average app on Android Go runs 15 percent faster compared to bone-stock Android Oreo. But most of Go’s tweaks are subtler. The Recent apps screen features a flat, vertically-scrolling list of thumbnails instead of Oreo’s Rolodex-like cascading cards as Google claims it’s less graphically demanding. A new section above the quick settings panel shows information about battery life, available storage, and data. 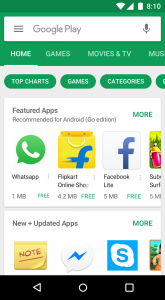 And Google Play Services, the bundle of Google services APIs that ships with almost every Android smartphone, has been re-architected from an APK into dynamic modules that can be loaded as needed, saving valuable system memory. Google Go, a renamed version of Google’s Search Lite app, supports bilingual searches and speeds up web browsing by loading pages asynchronously. YouTube Go, which launched in 2016, dispenses with the full-blown YouTube app’s subscriptions, comments, and channel sections. Instead, it offers peer-to-peer video sharing via a local Wi-Fi connection, and an offline viewing feature that allows users in developing countries download videos overnight. Files Go, a basic file manager, saves on storage space by recommending old, temporary, and duplicate files for deletion. Like YouTube Go, it supports data transfer via local Wi-Fi . In addition to Google’s Go-branded apps, Go ships with Gboard, Google’s third-party keyboard, and a customized version of the Play Store that highlights optimized apps for Go users, such as Skype Lite, Facebook Lite, and Twitter Lite. Android Go is shipping with Android 8.1 Oreo. Every device with 1GB of RAM or less will come with Go enabled by default, and Google says the first Go-branded hardware will hit store shelves in the coming months.